The running joke in our office is, “Pitching isn’t easy.” Ask any PR professional, and they’ll definitely agree. It can be a challenge to build relationships with publications, journalists, and influencers as a means of building brand awareness and reaching a targeted audience. That’s why my team at Fractl surveyed 1,300 publishers across all beats and authorities to get a better understanding of what they’re looking for and what they’re vehemently ignoring. With only two percent of publishers surveyed admitting they never read pitches, emails going straight to the spam or trash folder shouldn’t be the go-to explanation for your pitching being ignored (though it’s still a possibility). Rather, the answer is a bit more complex and could be due to a variety of factors typically revolving around the pitch itself. 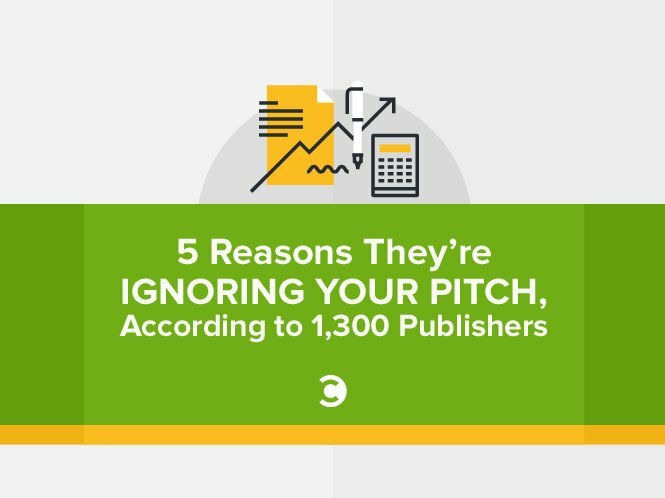 We narrowed it down to the five most likely reasons your pitch is actually being ignored. Here are some insights on how to avoid falling into these all-too-common pitfalls according to 1,300 writers, editors, contributors, and reporters. The most time-consuming aspect of media outreach shouldn’t be the email itself, but researching just where and who to pitch. 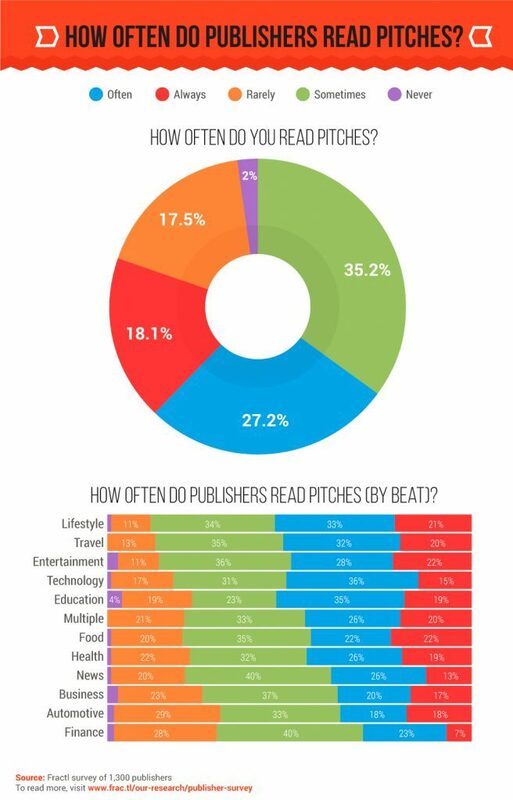 Seven out of ten publishers reveal one of their top pet peeves is pitches that are irrelevant to them and their beat, so take the time to find the right editor or writer for your content once you’re sure you’ve found the right publication. So what should research entail? Building potential contacts begins with brainstorming the publications and websites your target audience frequents, then prioritizing them based on who will have the most influence (usually higher authority sites have more readers and engagement). It’s essential to have a solid understand of where your target audience lives on the internet to help guide your targeting efforts and get your brand and content in front of the right readers. Of course, just because a publication may be a good fit for you doesn’t mean you’re a good fit for them; be sure they actually publish third-party content before seeking out the best point of contact for your initial pitch. Besides a cursory site search or browsing through the editorial contacts and archives, tools like BuzzSumo and Cision can help you find the best contact as well as influencers in your vertical. Even social media like Twitter lists can be a huge help in list building. Taking the time to find the best contact and then becoming familiar with that writer’s past work will help you craft a more personal and relevant pitch, which in turn helps you avoid another common publisher pet peeve: boring pitches. Start off with a strong subject line that will grab their attention—it’s the internet equivalent of a first impression. Further, stand out from a flood of boring and shallow email templates by finding a personal connection with the writer, whether that’s briefly commenting on an article related to the content you’re about to pitch or sharing a quick anecdote about a mutual interest you found on their Twitter bio. Nearly three out of five writers said a reaction to their recent article would make them more likely to read the entire pitch. 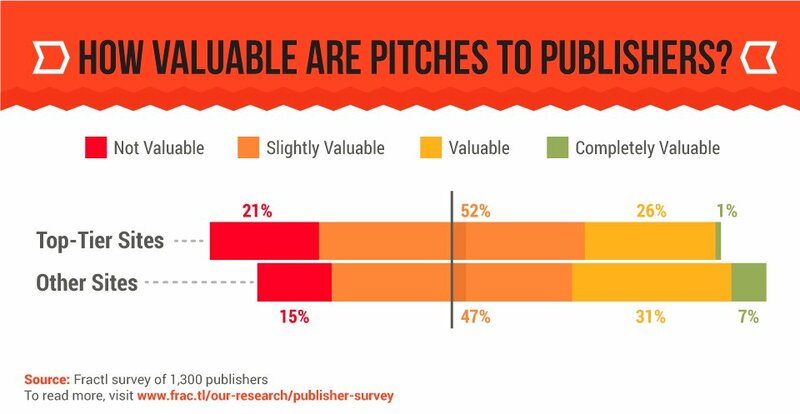 While the latter may come off as borderline professional stalking, it is surprisingly well-received—45 percent of publishers said a thoughtful personal connection would make them more likely to read the pitch. Once you’ve caught their attention with a killer subject line and short and sweet personalized introduction, you can move into the body of the pitch, where you’ll want to give a brief synopsis of your content and why it’s valuable to that writer and their audience. Failing to prove your value is another pet peeve among journalists, and given their flooded inboxes and impending deadlines, don’t expect publishers to go digging through your content to find a story. At this point you should be familiar with the readership and the writer’s beat, so put yourself in their shoes. Analyze the content you’re pitching, and pull the most interesting or unique findings applicable to them. Bullet a few key points, and if possible, include visual assets or other types of in-demand content. While photos are the most commonly published content formats, the demand for data visualizations and infographics are on the rise, according to publishers. Demand for more traditional formats like press releases are on a gradual decline. One way a pitch will instantly fail to prove value is by being overly promotional, another top pet peeve among 48 percent of publishers. Several journalists revealed they feel some PR professionals have their own agenda that doesn’t go beyond their corporate goals. Again, this is where proving the value of your brand’s expertise and content is crucial. Avoid overly promotional rhetoric, and focus the majority of your pitch on the value of the content for their audience more than your own brand—an underlying principle in inbound marketing. Unfortunately, there’s not a lot we can do about this final point. We learned 57 percent of writers at top-tier publishers receive 50 to 500 pitches per week, yet the average writer only writes five stories a week (or fewer). I went into writing partly because math was never my thing, but clearly these numbers don’t look great. The brutal but honest truth is this: You can do absolutely everything right, but your pitch may still go unread. Luckily, the insights this survey provided have helped us increase our own response rate by carefully crafting each pitch sent. Meticulous list building, personalizing pitches, and proving the value of your content will help you avoid the common PR pitfalls publishers reported as their biggest pet peeves.